Fundraiser by The Every Voice Coalition : Help The Every Voice Coalition! Help The Every Voice Coalition! We are students, young alumni, allies, and survivors of sexual violence in Massachusetts . We are tired of seeing statistics come to life in the stories of those we love. The status quo of sexual violence is not acceptable to us. Now, we are calling on our peers, our administrators, and our elected representatives to be impatient for change and join us in demanding justice now. We chose the name “The Every Voice Coalition” because we believe that every voice deserves to be heard. Because there’s also a lot that the 1-in-5 statistic leaves out. It leaves out that 1 in 16 men will be assaulted - yes, sexual assault happens to men, too. It leaves out that the rate is even higher for people who identify as non-binary, for people of color, for people with disabilities, for LGBTQ students, for first-generation college students, and members of other marginalized communities. It leaves out the human cost that sexual violence imposes on students, families, and communities. If we’re going to break the cycle of sexual assault, that’s where we need to start: the individuals and communities who are directly impacted by sexual violence. What we need, in Ayanna Pressley’s words, is for the people closest to the pain, to be the people closest to the power. But that power won’t be given over freely - it has to be won. For those of us who say #NoMore and #TimesUp we have to actually be willing to show up for change. And that means doing the hard work of movement building, of holding those in power accountable, and of remaining committed through obstacles. Here in Massachusetts, that work has already begun. From Boston University to UMass Dartmouth, Harvard to Bridgewater State, Brandeis to North Shore Community College, survivors are speaking out about sexual violence, and allies are joining them to demand change. Sexual assault is a complex issue, and there is no one solution, but there are a set of proven measures that we can implement now: Provide evidence-based training on response and prevention to students and staff. Grant survivors free access to medical services, advising, and counseling. Require fair, timely, and transparent investigations of all claims of sexual misconduct. Collect and publicly release data on sexual violence to increase transparency, measure progress, and find solutions. For the last four years, we have organized an all-volunteer campaign of students, survivors, allies, and community members to change how things are done in our state. The response has been incredible. Hundreds of students from more than 20 campuses across Massachusetts have gotten involved. 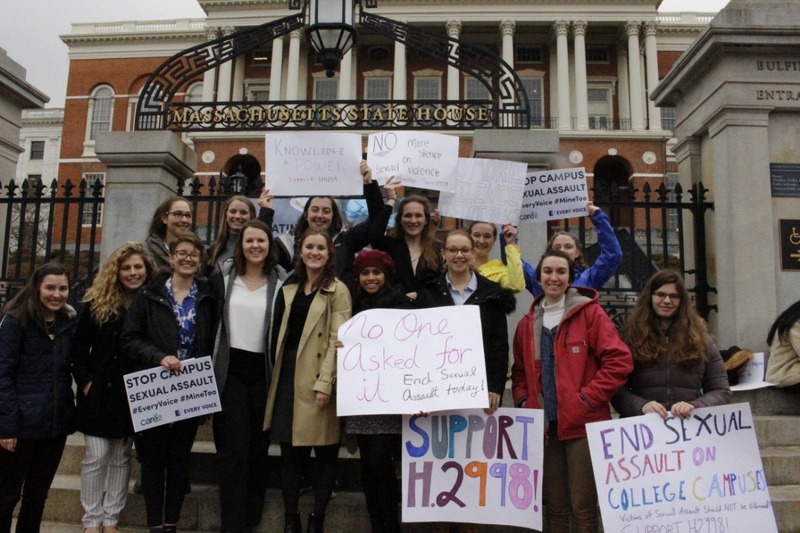 Student-written legislation addressing sexual violence has passed the Senate and the House after members of our coalition met with every single legislative office in Massachusetts. Almost 90,000 total supporters have signed a petition asking to pass these bills. We hope you will consider aiding in our efforts to fight sexual violence and support survivors. Every single dollar counts - no amount is too small. Together, we will push for the changes that are needed to combat campus sexual assault and keep future generations of students safe. Will you join us? We have raised $1,238 in 21 days! Thank you so much for believing in us and demonstrating your support for survivors. With your help we are getting closer to ending sexual violence. We have decided upon a new stretch goal of $2000, and this amount will still be matched by a generous donor! As a reminder, all of the money we raise is going directly towards sexual violence prevention and response work. Every single dollar counts!